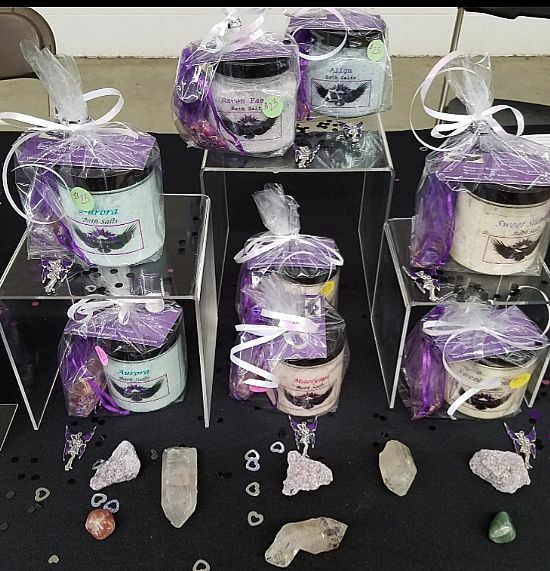 Raven Faery Magical Bath Salts are hand blended in smaller batches using high quality oils and salts to ensure that lots of love and magical intention go into each jar. Each jar contains herbs/flowers and chipstones chosen for the specific intention they are blended for. 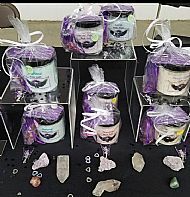 Blends are also infused with Reiki energy and charged by both sunlight and moonlight before being shipped to you. Get ready for a magical bathing experience that will leave you feeling amazingly balanced, pampered and empowered!! Blessings!! 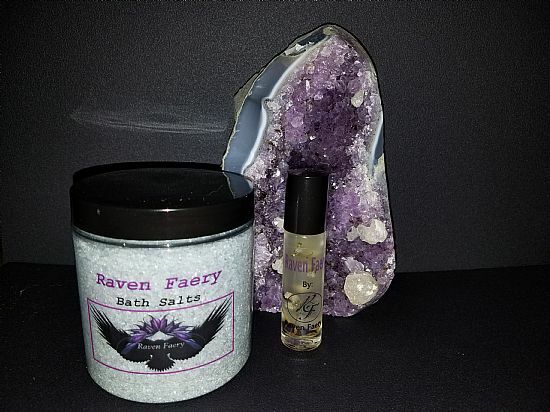 Raven Faery is pleased to offer this Magical Bath Blend Set at a savings to you!! Enhance your Magical experience while soaking away aches, pains and stress...the Raven Faery way!! Mix and Match for a truly magical experience. This set is for 2 10oz. 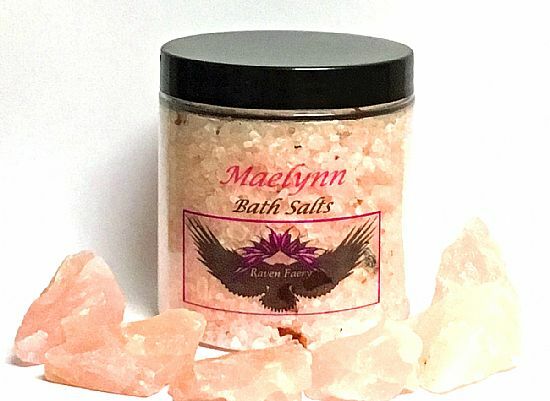 jars of Raven Faery Magical bath salt blend!! Raven Faery is now offering Magical Blend Sets!! This listing is for one Perfume Potion and one Magical Bath Blend of your choice at a savings to you. Just choose your favorite(s) from the drop down menu below and let the Magic begin. 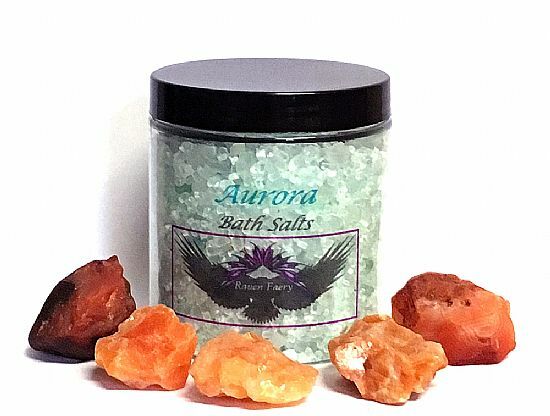 My Aurora bath salt blend will bring a totally magical experience to your bathing ritual!! Handcrafted with oils of Lemongrass, Sweet Orange, Pine, Cypress, Rosemary and pumped up with Peppermint, this blend will refresh, re-charge and inspire you like the Aurora Borealis!! Infused with Rosemary, Clear Quartz and Carnelian chipstones. 10 oz. 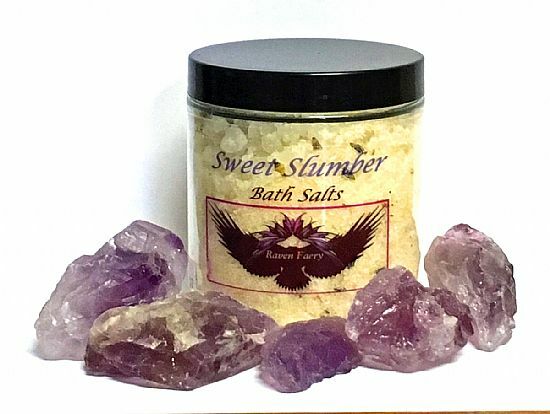 My Sweet Slumber bath salt blend was created to help promote a more relaxing atmosphere during the bathing experience. Blended with oils of Lavender, Lavandin (French Lavender), Palmarosa and a scoche of Lemon, Sweet Slumber will assist you with getting a better night's rest. Blended with Lavender and Chamomile flowers along with Amethyst and Clear Quartz chipstones. 10 oz.